گل محمدی, احمد. (1396). بازشناسی ادبیات انقلاب اسلامی ایران. تاریخ نامه انقلاب, 1(دفتر سوم و چهارم), 39-57. احمد گل محمدی. "بازشناسی ادبیات انقلاب اسلامی ایران". تاریخ نامه انقلاب, 1, دفتر سوم و چهارم, 1396, 39-57. گل محمدی, احمد. (1396). 'بازشناسی ادبیات انقلاب اسلامی ایران', تاریخ نامه انقلاب, 1(دفتر سوم و چهارم), pp. 39-57. گل محمدی, احمد. بازشناسی ادبیات انقلاب اسلامی ایران. تاریخ نامه انقلاب, 1396; 1(دفتر سوم و چهارم): 39-57. هدف از نوشتن این مقاله شناخت ادبیات انقلاب اسلامی ایران است. برای انجام این کار، برجسته‌ترین پژوهش‌ها دربارۀ انقلاب اسلامی ایران شناسایی و ویژگی‌های آن‌ها از منظر چارچوب نظری و الگوی روش‌شناختی تحلیل شد. با تحلیل مضمون این پژوهش‌ها، آشکار شد که شش الگوی تقریباً متوالی برای تبیین انقلاب اسلامی ایران قابل‌شناسایی است. تبیین کارگرایانه، نخستین الگوی تبیینی برای فهم انقلاب اسلامی بود، هرچند هم‌زمان با آن، نوع کم‌رنگی از تبیین مارکسیستی نیز شکل گرفت. الگوی سوم تبیین روان‌شناختی-جامعه‌شناختی بود که بر مفاهیم «محرومیت نسبی» و «آنومی» یا سردرگمی اجتماعی استوار بود. الگوی چهارم تبیین سازمانی متمرکز بر سرکوب و بسیج بود. الگوی پنجم را می‌توان فرهنگی-گفتمانی نامید که چگونگی مسلط‌شدن گفتمان تشیع را کانون اصلی بحث خود قرار می‌دهد. نوعی تبیین عقلانی را هم می‌توان در ادبیات انقلاب اسلامی ایران شناسایی کرد که درزمینۀ انقلاب‌پژوهی چندان کاربردی ندارد. البته پژوهش دربارۀ ادبیات انقلاب اسلامی بی‌پیشینه نیست و تلاش‌هایی برای بازشناسی و دسته‌بندی این ادبیات غنی انجام شده‌است ولی در این نوشتار، ادبیات انقلاب اسلامی ایران از دیدگاهی متفاوت بازشناسی، دسته‌بندی و تحلیل شده‌است که وجهی نسبتاً نوآورانه به یافتۀ پژوهش می‌بخشد. 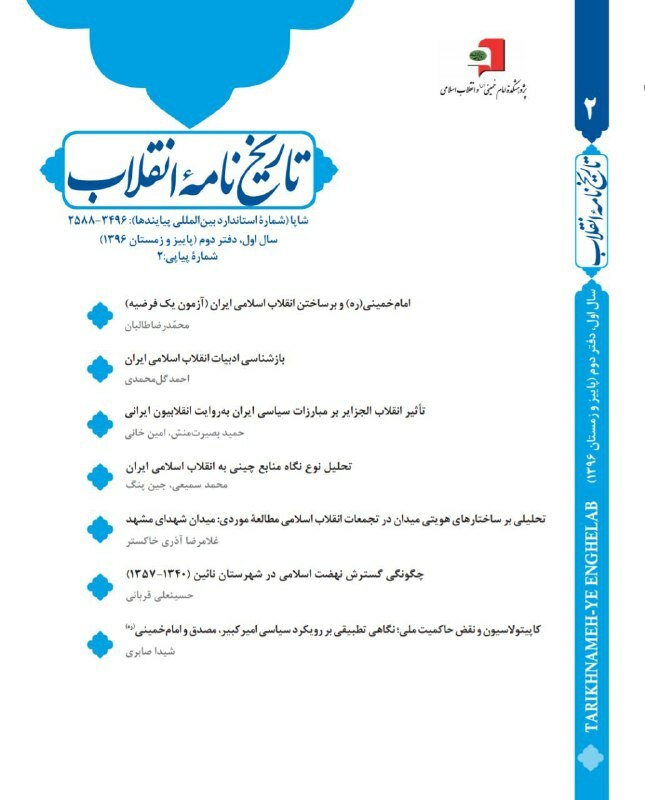 This paper is an attempt to identify the literature of Islamic Revolution of Iran. To this end, the most outstanding research works on Islamic Revolution of Iran have been identified and reviewed and their peculiarities analyzed in a theoretical and methodological framework. An analysis of the contents of these research works suggested that six almost interval patterns are identifiable for clarification of the Islamic Revolution of Iran. Functionalistic clarification was the first clarifying pattern for understanding the Islamic Revolution, although a dim trace of Marxist clarification was formed at the same time. The psychological-sociological clarification came next with emphasis on such concepts as "relative deprivation" and "anomie" or lack of the usual social or ethical standards in the society. The fourth pattern was organizational clarification focusing on suppression and mobilization of forces. The fifth pattern can be termed as cultural-discourse clarification that argues how Shia discourse became dominant in the discussions. A type of rational clarification can be also identified in the literature of Islamic Revolution that is not that much useful in research on revolution. Of course, there are many works on the literature of Islamic Revolution at hand. Some efforts have been made to re-identify and classify this rich literature, but this research work, reviews, classifies and analyzes the literature of Islamic Revolution from a different perspective that gives a relatively innovative aspect to the findings of the paper. آبراهامیان، یرواند. (1383). ایران بین دو انقلاب. (چ10). (احمد گل‌محمدی و محمدابراهیم فتاحی، مترجمان). تهران: نشر نی. جانسون، چالمرز. (1363). تحول انقلابی. (حمید الیاسی، مترجم). تهران: امیرکبیر. حاضری، محمدعلی. (1388). بررسی تحلیلی مطالعات انقلاب اسلامی. تهران: عروج. معدل، منصور. (1382). طبقه، سیاست و ایدئولوژی در انقلاب ایران. (محمدسالار کسرایی، مترجم). تهران: باز. Amir Arjomand, Said. (1988). The Turban for The Crown:The Islamic Revolution in Iran (Studies in Middle Eastern History). New York: Oxford University Press. Bashiriyeh, Hossein. (1984). The State and Revolution in Iran. New York: St. Martin’s Press. Bayat, Asef. (1987). Workers and Revolution in Iran:a Third World experience of workers' control. London and New Jersey. Binder, Leonard. (1962). Iran: Political Development in a Changing Society.University of California Press. Farhi, Farideh. (1990). States and Urban-based Revolutions: Iran and Nicaragua. University of Illinois Press. Fischer, Michael M. J. (1980). Iran: From Religious Dispute to Revolution. Madison, Wisconsin: University of Wisconsin Press. Foran, John. (1994) (ed.). A Century of Revolution: Social Movements in Iran. UCL Press. Kurzman, Charles. (2004). The Unthinkable Revolution in Iran. Harvard University Press. Milani, Mohsen. (1994). The Making of Iran's Islamic Revolution: From Monarchy to Islamic Republic. Westview Press. Moaddel, Mansoor. (1993). Class. Politics and Ideology in the Iranian Revolution. New York: Colombia University Press. Parsa, Misagh. (1989). Social Origins of the Iranian Revolution. New Brunswick: Rutgers University Press. Tilly, Charles. (1978). From Mobilization to Revolution. McGraw-Hill. Zabih, Sepehr. (1988). The Iranian Military in Revolution and War. London and New York: Routledge. Zabih, Sepehr. (1979). Iran's Revolutionary Upheaval: An Interpretive Essay. San Francisco: Alchemy Books. Abrahamian, Ervand. (1980). “Structural Causes of the Iranian Revolution”. MERIP Reports, No. 87. Binder, Leonard. (1980a). “Iran After the First Decade of the White Revolution”. Middle East Review Special Studies, n. 1, pp 3-17. Binder, Leonard. (1980b). “Iran: Crises of Political Development”. in Revolution in Iran, Middle East Review: Special Studies, n. 1, pp 18-40. Davis, James. C. (1962). “Toward a Theory of Revolution”. American Sociological Review, Vol. 27, No. 1 (Feb., 1962), pp. 5-19. Keddie, Nikki. R. (1983). “Iranian Revolution in Comparative Perspective”. American Historical Review, Vol. 88, No. 3 (Jun., 1983), pp. 579-598. McCarthy, John and Mayer N. Zald. (1977). “Resource Mobilization and Social Movements: A Partial Theory”. American Journal of Sociology, Vol. 82, No. 6 (May, 1977). Pp 1212-1241. Pesaran, Hashem. (1980). “Economic Development and Revolutionary Upheavals in Iran”. Cambridge Journal of Economics, September 1980, PP 271-292. Pesaran, Hashem. (1982). “The System of Dependent Capitalism in pre- and post-revolutionary Iran”. International Journal of Middle East Studies, Volume 14, Issue 4 November 1982, pp. 501-522. Silver, Morris. (1974). “Political Revolutions and Repressions: an Economic approach”. Public Choice, Volume 17, Issue 1, pp 63–71. Tullock, Gordon. (1971). “The Paradox of Revolution”. Public Choice, vol. 11, issue 1, pp 89–99.